The public has every right to be outraged over allegations that banks manipulated key global interest rates. But some consumers may have actually benefited from the Libor mess. NEW YORK (CNNMoney) -- Public outrage is growing over allegations that banks manipulated key global interest rates. But some consumers may have actually benefited. Wall Street has been abuzz the past two weeks since British banking giant Barclays (BCS) reached a $453 million settlement with U.S. and U.K. regulators, admitting that its staffers attempted to manipulate the London Interbank Offered Rate, or Libor. Libor is the world's most important benchmark for interest rates. Roughly $10 trillion in loans -- including some credit card rates, car loans, student loans and adjustable-rate mortgages -- as well as some $350 trillion in derivatives are tied to Libor. Given its vast reach, any changes to Libor mean huge shifts of resources globally. If the banks systematically suppressed it during the financial crisis, as has been alleged, many borrowers likely enjoyed lower interest payments as a result. On the other hand, pensions and mutual funds with investments in Libor-based securities -- effectively, lenders -- would have earned less in interest. "For every single person, it just depends on how much you borrow versus how much you lend, and it also depends the specifics of your own contracts and investments," said Rosa Abrantes-Metz, an associate professor at New York University's Stern School of Business who has studied Libor. Libor is designed to measure the cost of borrowing between the world's largest banks, generating rates that are used in contracts for all sorts of loans and derivatives. For example, an adjustable-rate mortgage might require you to pay interest based on a given Libor rate plus 2%. Between six and 18 large banks are asked what interest rate they would have to pay to borrow money for a certain period of time and in a certain currency. The responses are collected by Thomson Reuters, which removes a certain percentage of the highest and lowest figures before calculating the averages and creating the Libor quotes. The concerns about Libor's integrity center on two kinds of alleged manipulation. 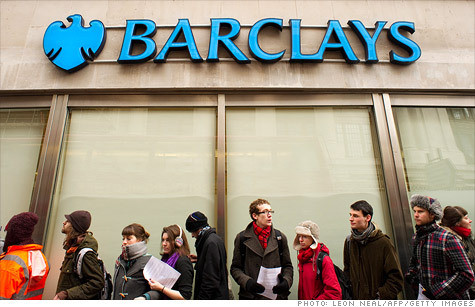 In Barclays' settlement documents, the bank admitted that between 2005 and 2008, its traders repeatedly requested that colleagues in charge of the Libor process tailor the bank's submissions to benefit their trading positions. They also colluded with traders at other banks in an attempt to manipulate rates. The logic is similar to that of insider trading in the stock market -- if you have advance knowledge of information that will affect a security, you can make trades to profit from it. It's hard to say what cumulative affect, if any, these actions had on consumers -- the biggest victims were likely other traders. Emails disclosed as part of the Barclays settlement show traders requesting that rates move both up and down, apparently with no systematic bias in either direction. Separately, however, Barclays admitted to artificially lowering its Libor submissions between August 2007 and January 2009, as the financial crisis gathered force. The bank was afraid that if its submissions were too high, it would get punished in the markets as investors questioned its health. It claims it was only following the lead of other institutions engaged in the same behavior, and in fact, even its artificially low submissions were sometimes above the average level from other banks, according to settlement documents. Deutsche Bank (DB), Royal Bank of Scotland (RBS), Credit Suisse (CS), Citigroup (C, Fortune 500), UBS (UBS) and JPMorgan (JPM, Fortune 500) are among the other institutions that have acknowledged they are being investigated by regulators. It's difficult to say exactly what Libor rates "should" have been during the crisis, given that banks were reluctant to lend to one another and real transactions on which to base Libor submissions were scarce. Nonetheless, the evidence suggests the banks pushed rates lower than they would have been in an honest accounting, providing a subsidy to many borrowers in the process. "If it really was the case that the banks were systematically lying on the low side during the crisis, a lot of people were paying less on mortgages and loans," said Dean Baker, co-director of the Center for Economic and Policy Research. "On the flip side, people holding those mortgages and notes were earning less than they should have." A number of litigants have already filed civil suits against the banks, claiming that they lost profits on Libor-based securities. In one suit, for example, Charles Schwab (SCHW, Fortune 500) says one of its investment funds purchased debt securities from the banks in which the interest payments rose and fell with Libor. With Libor's alleged suppression, Charles Schwab says, it was deprived of the higher interest payments it deserved. In another complaint, investor Ellen Gelboim claims she purchased corporate debt that paid variable interest based on Libor, and suffered lower returns as the banks held the rate down. How exactly such investments were affected depends on their specific terms, Abrantes-Metz said. There are also investors who purchased futures that allowed them to speculate on the direction of interest rates. Due to Libor's alleged suppression, they've claimed in lawsuits, their futures contracts paid out less than they should have. Beyond the individual level, many municipalities claim to have been hit hard by a lower Libor. Plaintiffs like the City of Baltimore and a public employee pension fund in Connecticut say they suffered after purchasing common financial products called interest rate swaps from the banks. In these swaps, the banks paid interest at a variable rate based on Libor. With Libor suppressed, the suits claim, the banks paid millions of dollars less than they should have. "Defendants caused LIBOR to be calculated or suppressed artificially low, reaping hundreds of millions, if not billions, of dollars in ill-gotten gains," Baltimore's suit says. Attempts to quantify the effect on a particular group or individual are complicated by the complexity of the Libor-setting process, the variety of banks involved and the myriad of financial instruments Libor influences. In any case, beyond any individual gains and losses, the economy has been harmed in a broader sense if the allegations are proven correct. For one thing, market participants and regulators were given inaccurate information on which to assess the health of the banks as they made investment or policy decisions. For another, regardless of whether the manipulation attempts were successful, the revelations of the past two weeks have further eroded trust among investors. "The real issue is that alleged manipulation undermines the credibility of financial markets, and that's what regulators should have zero tolerance for," said Greg McBride, a senior analyst at Bankrate.com.